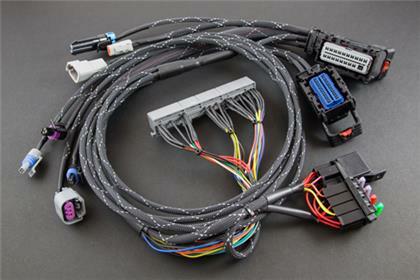 BF19140-708 - Boomslang Plug n Play Harness - AEM Infinity 7 - MiataRoadster - Stay tuned with MiataRoadster! These are harnesses for the use of AEM’s Infinity Series 7 units. The Infinity has full control of fuel and ignition timing. Some vehicles may need an aftermarket crank/cam angle disc if the vehicle’s factory crank/cam pattern is not officially supported by AEM. In some instances, the factory ECU remains in place to control dash gauges, drive-by-wire throttle systems, and other amenities. The factory ECU can be replaced if all vehicle functions are fully supported by AEM. Dodge/Ford/Hyundai/Kia applications include the mandatory aftermarket coil drivers wired into the Boomslang harness. AEMNet, AEM UEGO, and AEM Flash Enable connectors are wired into the Boomslang harness. We fabricate the sub-harnesses. No cores needed.